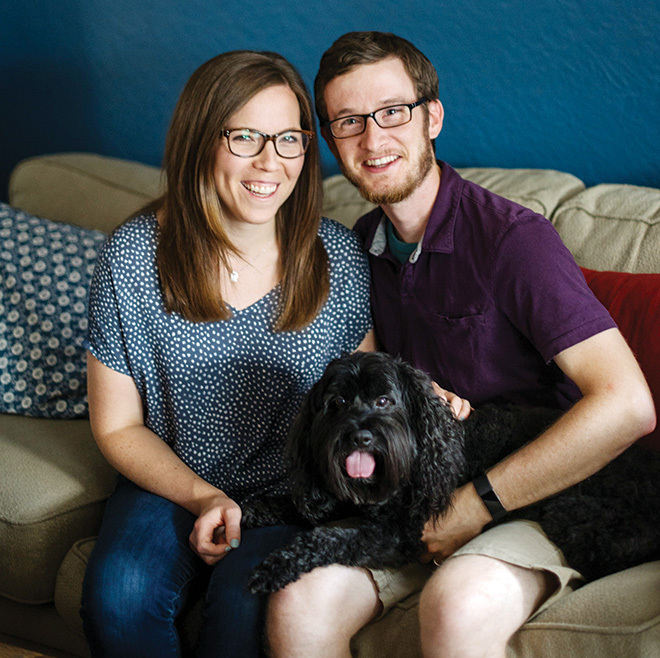 Adoption Link, Inc. | Waiting Adoptive Family | Meet Caitlin & Mike B. Meet Caitlin & Mike B. It is with hopeful anticipation that we write this letter as part of our process towards adoption. We are grateful for your willingness and openness to consider us as adoptive parents. We cannot imagine the thoughts, questions, and feelings you must be having in making this decision. We hope this profile gives you a glimpse of who we are and what kind of life your child would have with us. Caitlin grew up in Cincinnati and has three brothers. Growing up, Caitlin and her siblings loved to perform in plays and musicals, and most of all make each other laugh. She is a drama and choir teacher at a private Catholic high school in downtown Dayton. Caitlin is passionate about helping young people express themselves through music, acting, technical theatre, improv, and dance. She loves being active and has run several half marathons and one full marathon. Caitlin also enjoys performing and improvises at the Black Box Improv Theatre. She loves to sing and has taken voice and piano lessons for 15 years. Mike also grew up in Cincinnati and has three older siblings. After volunteering for two years in West Virginia and finishing graduate school in theological studies, he began working as a Campus Minister at the University of Dayton. Mike loves connecting one-on-one with others, helping them learn about themselves and their gifts and passions, and guiding them to embrace faith more fully in their lives. He enjoys gardening, cycling, and has a great appreciation for craft beer. 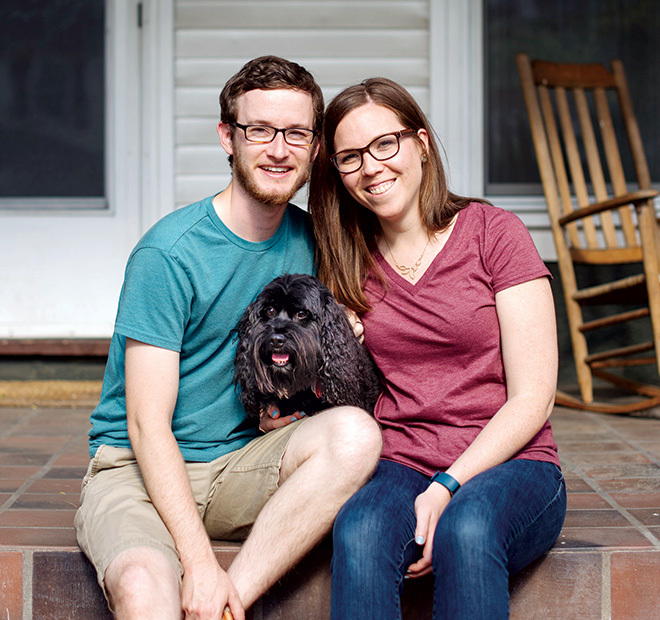 We met in college at the University of Dayton while participating in a 9-week summer service program that works with children, teens, and families in Salyersville, Kentucky. We have been together for 10 years, married since 2010, and have built a life centered around faith, family, community, and fun. We feel called to be parents and we are excited for the blessings adoption can bring to us and our family. There are a lot of people very excited to love our child! We are both active in our church, and are part of a small faith community of 14 adults and 9 children. This community serves as our “local family” and is a wonderful support to us and our growing family. Our future child will have a lot of fun getting to know and play with the other children in the community. In addition to our faith community, our family is very supportive of us and are also excited for our family to grow through adoption. A majority of our family lives in the Cincinnati area, including our nephews and niece who are 13, 11, and 9. We have lived in a quiet urban neighborhood in Dayton for 7 years and are close to much that Dayton has to offer including schools, theaters, local restaurants, metro parks, and entertainment. We also have a very cute, very furry cockapoo named Archie that we adopted from the Humane Society five years ago. We are excited to share faith, family, community, and fun with our future child. Thank you for learning more about us and considering us as parents for your child. You are in our prayers, and we hope you will keep us in yours.